I have more than 2,000 photos of dogs and their people in my collection. Four of them are my favorites and this is one of them. 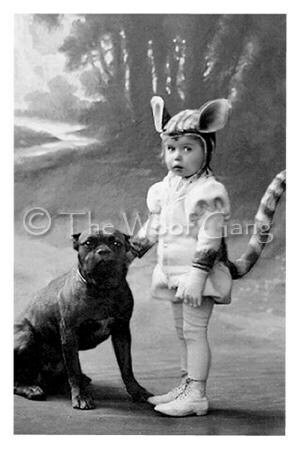 It was common practice at the end of the 1800's and early 1900's to pose children with animals in studio photographs. Some were intended for commercial use as post cards, others were simply to bring added interest to the photo. I've never understood what purpose this photo would have served. Most photos of this sort used soft, fluffy, cute dogs or cats that when coupled with the adorable child make an appealing image. This photo is almost the exact opposite. I don't know who's the most apprehensive, the child or the dog. But clearly each of them is terrified of the other! What could they have been thinking, dressing a child in a costume that made it look like prey? I don't have a clear sense of the dog's breed, most probably a mix of Pit Bull, Bull Dog or Rottweiler, a guesstimate based primarily on the shape of the head. At that time, there was a lot of experimental breeding going on as the various breeds evolved into their various forms. I know nothing about the photo except that it is a studio shot and was taken in Germany in 1904. But the photo continues to draw me in and even after looking at it for more than 20 years, it fascinates me still. This card looks just like a little girl I know who has a pit bull, so it was a great item for me! This one did come in the correct size, but for reasons listed above, I cannot say this was a great etsy experience at all.